Winemaker’s Notes: Ruby red to garnet red color. Aromas typically of berries and sour cherries, mature and seductive. The flavor us harmonious, soft, full-bodied with rich fruit. Pair with red meats, lamb, fowl, and game. My Review: Some time ago I got to try several wines from Alto Adige, and I mostly enjoyed them; Italy has always had a soft spot for me when it comes to wine, and getting to try new regions (new to me anyway) is always welcome. Back in July I got to try the 2017 Peter Zemmer Pinot Grigio, and after (too) much delaying, I’ve finally come around to trying the Pinot Noir. In the glass the wine was a light garnet red, and on the nose I picked up ripe berries and a hint of spice. In the mouth the wine carried through red berries, with a velvety mid-palate and soft finish that managed to remain light and enjoyable throughout. Paired with burrata and some cherry tomatoes sauteed with balsamic vinegar, the soft berry notes and lighter mouthfeel were a nice contrast to the rich cheese and tartness of the balsamic vinegar. Pinot Noir is typically one of my go-to reds in the summer for its lighter body (that and bigger reds to go with grilled meats), and this is a great example of why; it’s a great option for pairing with food, but as the heat drags out here in North Carolina, the heavier reds are going to have to wait until October (or November at this point). This one is worth checking out, and for the price it’s a fantastic value. 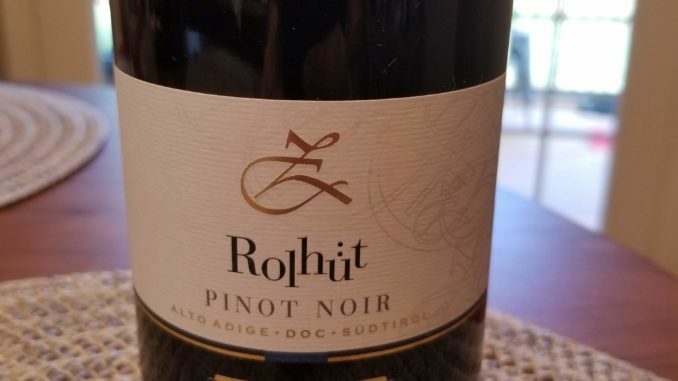 If you’re a fan of Pinot Noir, but want to break out of the Oregon, California, France rut, this is a good way to do so without having to break the bank.